Jacob A. Fortinsky '21, a Crimson Editorial editor, is a Social Studies concentrator in Winthrop House. Two weeks ago, the Harvard College undergraduate body voted overwhelmingly in favor of two referenda urging the University to divest its endowment from holdings in the fossil fuel industry and the “prison-industrial complex.” These two industries are among the most heinous imaginable, benefiting from the burning of fuels that severely exacerbate the warming of our climate and excessive incarceration, respectively. Harvard should sever all ties from these industries and should follow the voices of its students. Fossil fuels such as coal, oil, and natural gas are by far the largest source of greenhouse gas emissions in the United States and in the world. 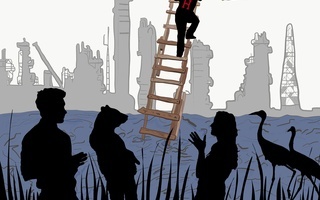 Aside from possibly deforestation, there is nothing humans have ever done that comes close to fossil fuels in the massive harm wreaked on our planet. Though recycling and buying local produce are important, climate change cannot be stopped by consumers. It can only be stopped by targeting and punishing those directly responsible for it. The burden ought to fall on the unethical corporations that have benefited from destroying our climate. History will not look favorably upon those who benefited from mass incarceration and climate change. By maintaining its investments in these industries, Harvard is undoubtedly placing itself on the wrong side of history. Unfortunately, there is little that any of us as individuals can do to stop these two colossal injustices. That is why radical, systemic change is necessary. And that is why Harvard should take the lead — economically as well as academically and politically — in fighting for a more just world. Critics, such as The Harvard Crimson Editorial Board, upon which I sit, argue that if the Harvard Management Corporation were to adopt divestment policies, it would effect little financial change and have “no ability to effect social change.” This line of thinking is severely misguided for several reasons. 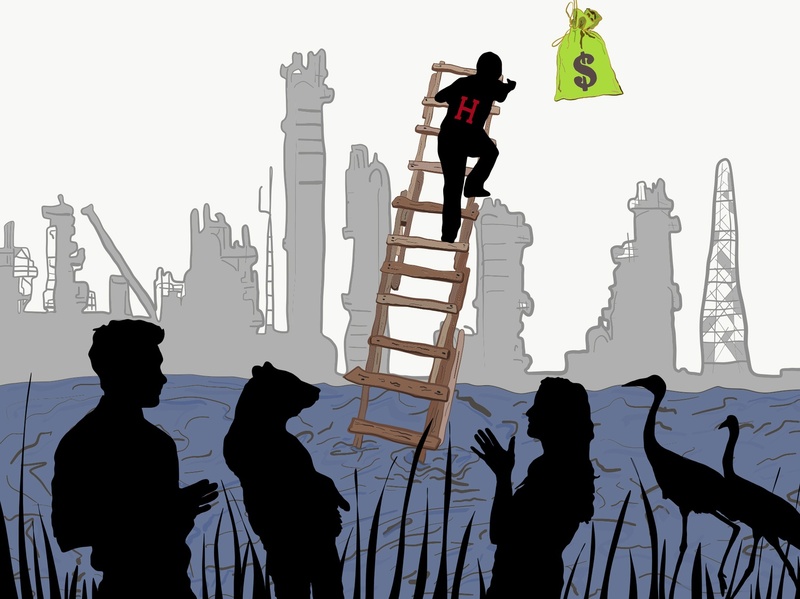 Even if it were true that the divestment of select investments from a $39.2 billion endowment does not exert serious financial pressure on the affected industries, which is indiscernible until implemented, the symbolic value of Harvard taking a stand against the private prison and fossil fuel industries cannot be understated. If Harvard were to publicly condemn, and divest from, these industries, many institutions would surely follow. It would also send an unequivocal message that Harvard “walks the walk” when it comes to protecting our planet and justice for all. 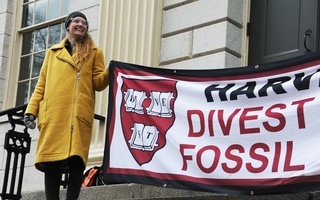 Yet, even if it were true that Harvard’s potential divestment would not affect any change, either symbolic or financial, which I do not believe is the case, Harvard nonetheless ought to divest from these industries. Entanglement with fossil fuel and the prison-industrial complex taints Harvard’s moral character and such entanglement is wrong in itself. It is flawed to judge the morality of an action simply by its consequences. For example, it would be wrong for Harvard to donate money to the National Rifle Association, even if such a donation did not lead to any legislation or an increase in gun deaths. Likewise, it is fallacious to analyze Harvard’s holdings in fossil fuel or private prison corporations strictly in terms of their impact. There has been great opposition to Harvard accepting donations from unethical people, institutions, and countries. I greatly sympathize with these concerns. These donations are worrisome not just because they tarnish Harvard’s research and reputation but because accepting this money is intrinsically dubious. Yet the issue of investing in immoral industries certainly ought to be just as problematic as accepting money. If Harvard would not accept money from the fossil fuel and prison industries, then why should it essentially be giving them money? Surely, supporting immoral industries is worse than being supported by them. 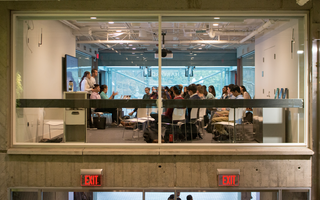 The endowment is not a wholly separate entity, but rather an integral component to Harvard’s mission. Harvard should strive to be a moral institution that cares for our planet and our fellow human beings. Doing so requires the complete and immediate divestment of its endowment from the fossil fuel industry and the prison-industrial complex. Harvard’s integrity is at stake. Jacob A. Fortinsky '21, a Crimson Editorial editor, is a Social Studies concentrator Winthrop House.